It’s a pajama bag! It’s a pillow! It’s a toy! 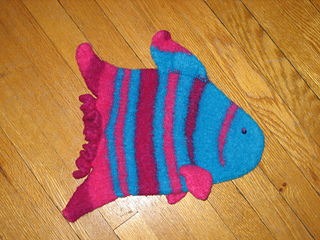 It’s felted! It’s huge when made with 14 ply WoolPak! 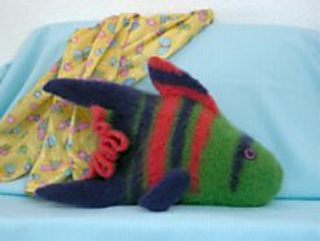 The Felted Fish PJ Bag & Pillow measures approximately 22”-24” from mouth to tailfin tips (when made with bulky yarn). Knit a “school” in three different yarn weights for a child’s bed. Use stash yarn for bright stripes and accents. Pattern is written for bulky yarn with changes for worsted and sport in parentheses (). Finished siez bulky: 22” x 10”, worsted 16” x 8”, sport 13” x 6 1/2”.